The Dude abides: Jeff Bridges & The Abiders play Fremont Theater! BAD BLAKE! : Jeff Bridges & The Abiders play Feb. 21 at the Fremont Theater. As much as I enjoyed seeing Jeff Bridges & The Abiders in the cozy environs of SLO Brew, I’m looking forward to his show at the Fremont Theater on Friday, Feb. 21 (doors at 6:30 p.m.; 21-and-older; $40 presale or $45 at the door). First of all, it’s not like I could make it through the impenetrable wall of glowering, elbow-throwing women to get close enough to the stage to get a good look at The Dude. Second, I’m getting on in years and it’s nice to sit down, especially for a show like Bridges’, most of which is about soaking in the soulful vibe of the music rather than boot-scootin’ boogie. Third, it’s in the freaking Fremont Theater, which is an awesome venue for live music (or Russell Brand, or a movie. I just like being in there). Bridges has been playing a lot of music as of late, but it’s not like he’s given up acting. His most recent film, R.I.P.D., wasn’t his best, but the guy’s hit home runs with films such as True Grit, Crazy Heart, Iron Man, Seabiscuit, Arlington Road, and his best known role as Jeffrey Lebowski (aka The Dude) in the Coen Brothers’ 1998 cult classic The Big Lebowski. His early career was pretty incredible too. The Last Picture Show is amazing, but there’s also Thunderbolt and Lightfoot, Rancho Deluxe, the camptastic King Kong, Heaven’s Gate, Cutter’s Way, Star Man, Jagged Edge, 8 Million Ways to Die, Tucker: The Man and His Dream, and The Fabulous Baker Boys. Later this year, he stars with Meryl Streep in The Giver, he’s currently doing voice work for an animated version of Antoine de Saint-Expuréry’s The Little Prince, and recently completed filming on Seventh Son, an adventure due out in 2015. Most actors would cut off their thumbs for a career like Bridges’, but these days, The Dude’s got nothing to prove, and he loves being on stage, playing music. The 2009 Oscar-winning drama Crazy Heart proved he was a real musician, and his childhood piano training was on display in the 1989 film The Fabulous Baker Boys with his brother Beau Bridges. It’s also known that while working on the 1980 film Heaven’s Gate, he often played guitar and sang with co-star Kris Kristofferson between takes. Way back in 2000 he released his first album, Be Here Soon, which proved he had the chops to play “Bad” Blake, a character partly based on Kristofferson. Bridges is a lifelong musician, and after Crazy Heart came out, he built a recording studio next to his garage on his 19-acre mountaintop home that overlooks Montecito, near Santa Barbara. 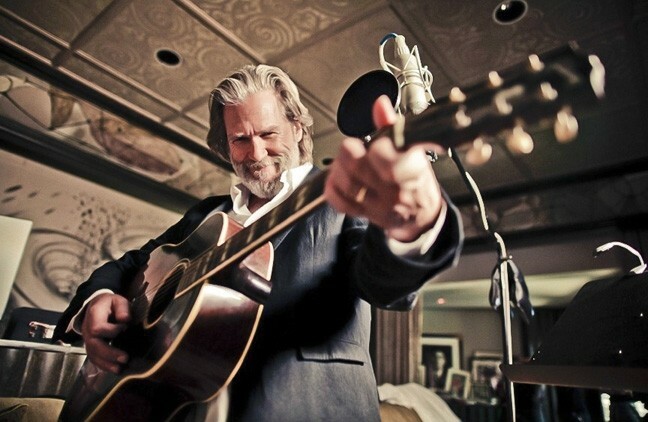 His most recent album, 2011’s Jeff Bridges, peaked at No. 2 on Billboard’s Top Folk Albums chart and No. 5 on its Top Rock Album chart. It’s a solid piece of work produced by T-Bone Burnett. During his shows, he performs songs from Crazy Heart, select covers, and songs from his two albums. Plus, you get to hang with The Dude in the Fremont! He’s a man at the top of his game, and he can do whatever the hell he wants, and what he wants to do now is make music. If you’re interested, I recommend getting tickets today. I’ve had a bunch of friends asking me if I can get them tickets to the two sold-out Devil Makes Three shows at SLO Brew on Wednesday, Feb. 12, and Thursday, Feb. 13, and nope, I can’t. When they’re gone, they’re gone, so stop messing about and buy your Jeff Bridges tickets! On a more positive note, there’re still tickets for Los Lobos and Sergio Mendoza Y La Orkestra at SLO Brew on Saturday, Feb. 15 (7:30 p.m.; 21-and-older; $49 presale or $55 at the door). This year marks Los Lobos’ 40th anniversary, proving that they’re not just another band from L.A. What an amazing career these guys have had, and what incredible music they’ve made over the years. This should be a terrific, intimate show. AH, YOUTH! 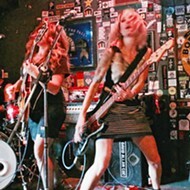 : Hot, up-and-coming trio The Spaces Between play an album release party at SLO Tracks on Feb. 15. You can get your Cali ska and reggae fix when The Mad Caddies play SLO Brew on Sunday, Feb. 16 (7:30 p.m.; all ages; $15 presale or $18 at the door). I dig their horns and their smooth style, and it’s hard to believe they’ve been around since 1995! illScarlet opens the show. Finally, on Wednesday, Feb. 19, Shwayze and Terraplane Sun play (7:30 p.m.; all ages; $16 presale or $18 at the door). Is there anything better that the junction between ambition and creativity? Open YouTube and search for The Spaces Between’s song “Maybe” and soak in the glory of this young, local band and their music video about a surfin’ Sasquatch. 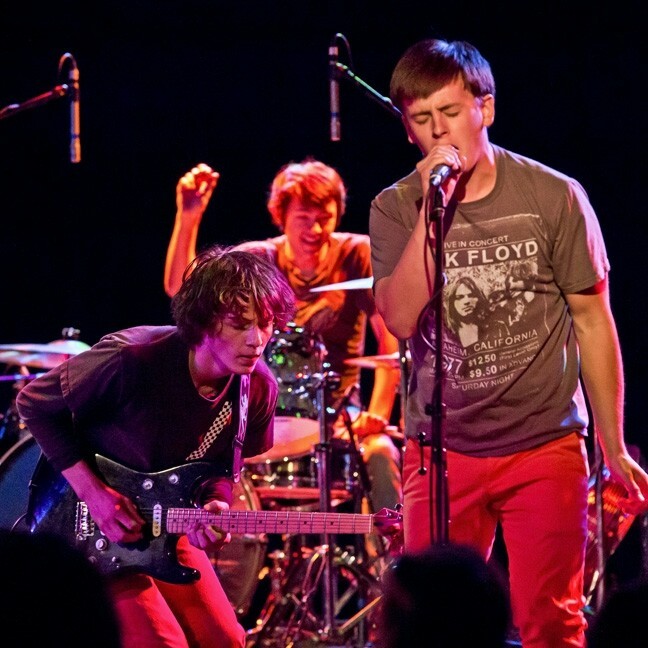 The trio features guitarist Andrew Rubin (son of Leigh Rubin, the brilliant cartoonist behind the syndicated “Rubes”), bassist-vocalist Noah Colton, and drummer Liam Smith. This Saturday, Feb. 15, they’re releasing their debut album Let’s Leave It At This For Now… during a show at SLO Tracks (3 p.m.; all ages; $10 at the door). Co-produced and mixed by current Blind Melon vocalist Travis Warren, the album features eight tracks along with a special guest appearance by the voice of YES, Jon Anderson. See? Ambition! The Spaces Between has already brought their funk, jazz, alternative, and rock fusion sounds to Hollywood clubs such as Whisky a Go Go, the Roxy, and the Viper Room. They also played the Live Oak Music Festival. 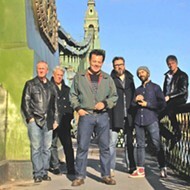 You can also listen to their first single “Underwater Castle” at reverbnation.com/thespacesbetween. UKE MASTER! 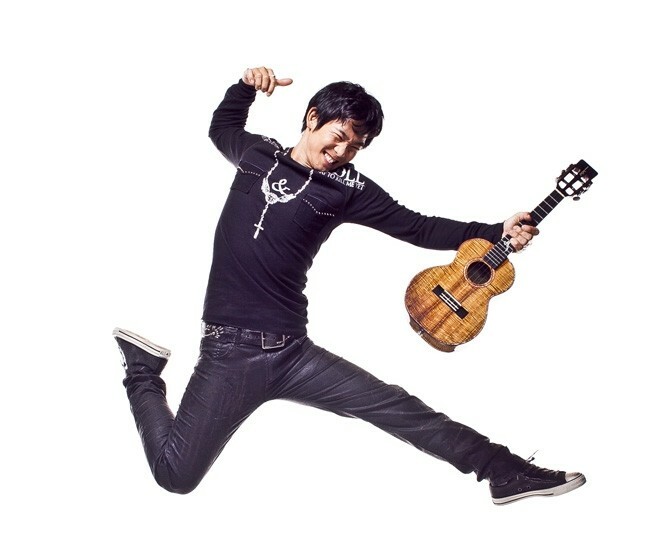 : Incredible ukulele player Jake Shimabukuro plays the PAC on Feb. 16. Joining them this Saturday will be St. Vincent Folk and Travis T. Warren. It’s a little tricky finding the venue, located at 1 Vintage Ranch Rd., near the south end of the SLO Airport. It’ll be marked, but you take a dirt road at the north end of Tolosa Vineyard, just north of Buckley Rd. It’ll be worth the search! The guy has literally redefined what can be done on a ukulele. He recently followed up his No. 1 charting 2011 album Peace, Love, Ukulele with a new album with producer/engineer Alan Parsons, best known for his work on Pink Floyd’s Dark Side of the Moon and The Beatles’ Abbey Road. SYNERGY! 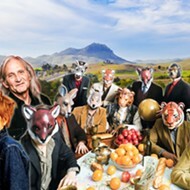 : Witness the power and glory of Shadowlands on Feb. 14 at D’Anbino. Parsons brought in a 29-piece orchestra and a big-name rhythm section, including drummer Simon Phillips (The Who, Toto), session superstar bassist Randy Tico, and Kip Winger (Winger, Alice Cooper), who helped with the orchestration. Tickets are $26 to $55. Call 756-4849. Shadowlands is so freakin’ awesome, a perfect example of everyday magic that can occur between four really talented individuals who feed off one another’s creativity. On Friday, Feb. 14, you can get all romantic and stuff at D’Anbino Cellars (7 p.m.; $10; reservations suggested 227-6800; plus for $10 more access to a chocolate buffet! Woot woot! ), when they play with Girls and Boys. Let’s see, that makes three couples performing on Valentine’s Day! Feel the love! And visit songwritersatplay.com for all their songwriter showcases this week. Bettman & Halpin play the next Música Del Río House Concerts in Atascadero on Friday, Feb. 14, at 8 p.m. (Tickets are $20; reservations at 466-6941). Singer-songwriter-fiddler Stephanie Bettman has been compared to Emmylou Harris, Joan Baez, and Alison Krauss. Her multi-instrumentalist husband Luke Halpin will join in on mandolin, fiddle, and guitar. BLISS! 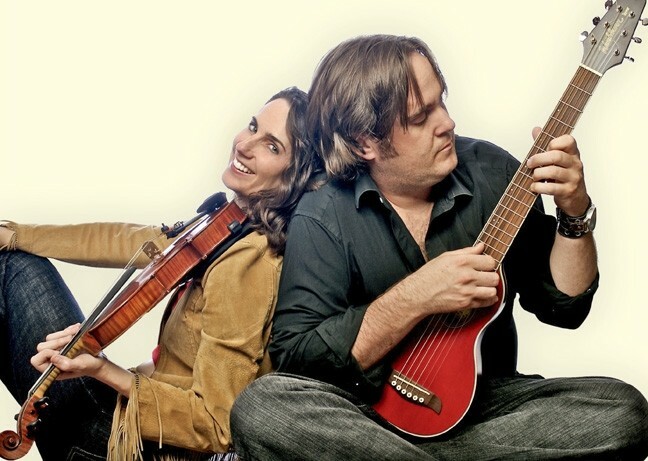 : Excellent husband and wife duo Bettman & Halpin play the next Música Del Río House Concerts on Feb. 14. The Oly Mountain Boys from—guess where? Olympia, Wash.—are making their first ever foray into California this month with a few local stops: Friday, Feb. 14, at Paso Robles Brewing (8:30 p.m.); Saturday, Feb. 15, at Castoro Cellars (7 p.m.); and two shows on Sunday, Feb. 16, first at the Morro Bay Vets Hall (5 p.m.) and then later than night Frog and Peach (10 p.m.). 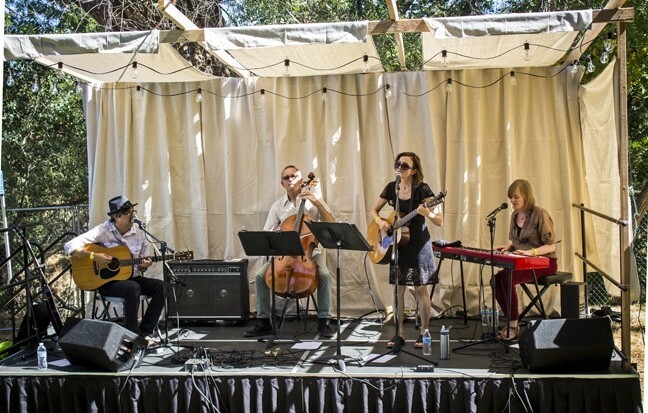 “We play original and traditional bluegrass, not unlike a band called Steep Ravine from Santa Cruz that I know played in SLO late last year,” said band member Tye Menser (banjo and lead vocals). Get your “yee-haw!” on! The Booker Tease, our great local Booker T. & The MGs tribute band, brings their swank sounds to Broken Earth Winery this Saturday, Feb.15, from 1 to 4 p.m. These dapper lads will deliver takes on great Booker T songs as well as similar fare. You’ll feel like James Bond, plus you get to drink wine! On Saturday, Feb. 15, a trio of exceptional local performers—soprano Katherine Arthur, clarinetist Caroline Tobin, and pianist Louise King—will delight their audience in an afternoon concert intended to raise funds to support the San Luis Coastal Adult School. The concert starts at 4 p.m. at Trinity United Methodist Church ($15 presale or $20 at the door; call 549-1222). BLUEGRASS, BABY! 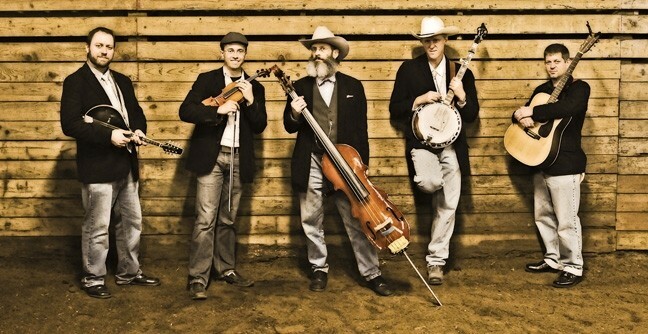 : Oly Mountain Boys bring their bluegrass to California for the first time with shows on Feb. 14 (Paso Robles Brewing), Feb. 15 (Castoro Cellars), and Feb. 16 (Morro Bay Vets Hall and Frog and Peach). Don’t forget that amazing jazz vocalists Dawn Lambeth and Judy Philbin will embark on a “Sentimental Journey” on Saturday, Feb. 15, when they play a 7:30 p.m. concert at Unity Church, accompanied by Bob Harway (piano), Adam Levine (guitar), Ken Hustad (bass), Karl Welz (saxophone), and Darrell Voss (drums) in a program that will include familiar tunes from the early American jazz era into the ’70s. Tickets are $20 general admission, $15 for Jazz Federation Members, and $10 for students. Call to reserve at 546-3733. 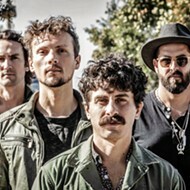 Santa Cruz-based The Coffis Brothers & The Mountain Men play Frog and Peach on Saturday, Feb. 15, touring in support of Wrong Side of the Road, and album to be released on Feb. 22. I checked out a few tracks, and this is a gritty, tight, inventive country rock act with hooky songs, harmony vocals, and crisp musicianship. 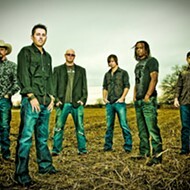 Fans of Tom Petty and Neil Young will dig these guys’ rootsy vibe. Great keys by Jamie Coffis! His brother Kellen rips the guitar! See these guys! The show’s at 10 p.m.
On Sunday, Feb. 16, the next Famous Jazz Artist Series concert will feature trumpeter Kye Palmer, former soloist with the orchestras of Woody Herman and the Tonight Show band, at D’Anbino Wine Tasting Room. Bassist Ken Hustad, drummer Darrell Voss, and series co-producers Charlie and Sandi Shoemake (piano/vibraphone and vocals) will join in on two performances, one at 4 p.m. and another at 7:15 p.m. Tickets are $15 each, or pay $20 and see both shows (call 927-0567 for reservations).